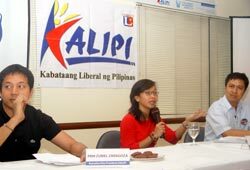 Stormy weather did not discourage 70 young liberals from coming to the forum on youth activism on May 18, 2005 in Makati City co-sponsored by Kabataang Liberal ng Pilipinas (KALIPI), the Young Liberals and Democrats of Asia (YLDA) and the Friedrich Naumann Foundation (FNF). Former KALIPI President Noel Medina outlined the rich tradition of youth involvement in the Philippines from the American era to the present. Emphasizing key points in modern Philippine history such as the Marcos dictatorship, the closure of the U.S. Bases, EDSA I and EDSA II and the recent anti-Davide impeachment drive, he characterized these instances as defining moments of youth involvement. KALIPI Secretary General Jan-Argy Tolentino closed the forum and said that KALIPI has been in the forefront of youth led initiatives not only in the Philippines but in the wider Asian region also. The Filipino Young Liberals are founding members of YLDA, which only recently set up their permanent secretariat in Makati City. The official inauguration of the YLDA secretariat actually followed the seminar.